Hasn't it rained a lot? Well, at least it has here in Dorset. One or two of my pals have done some sea fishing and it looks as though the Chesil Beach is fishing better now, as my mate Nigel had a wide range of species on his latest session including codling, smooth hounds, huss and pouting. Bill has also been catching one or two bass on lures, although the bassing is still a bit slow and Richard has had some nice perch and a monster chub from the river. Personally I've been wary of too much tramping along the shore because my back has been playing up a bit, but with the others catching fish it was all becoming a bit hard to bear. I had reached the stage where some sort of fishing was essential to retain a shred of sanity so I decided to have a gentle hour spinning for seatrout. 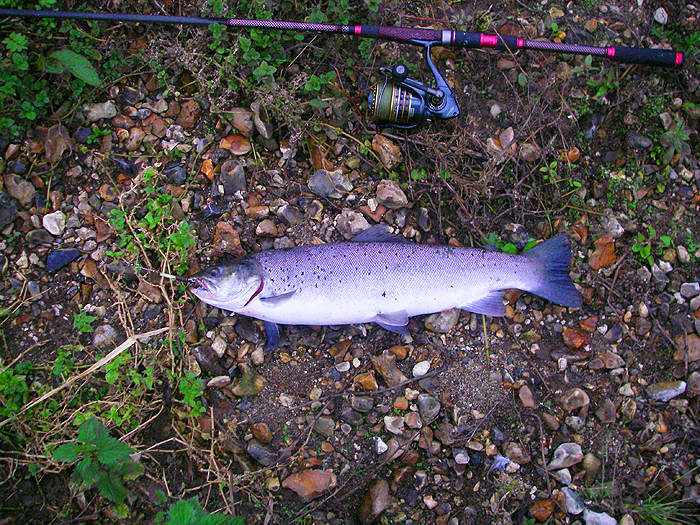 We were in a bit of a lull between depressions so I reckoned that the river would be clearing a bit and it was even possible that the seatrout might have been stirred by the fresh water. Anyway, after my evening meal, armed with the Teklon rod, Mitchell reel, 17lb Nanofil and my glow-in-the-dark size 4 Mepps, I set off to the river. Conditions looked as good as I could have expected. A bit of a 'tea stain' in the water but relatively clear and not too much of a northerly wind so casting wouldn't be a problem. It was raining again by the time I arrived but only fine drizzle so not a problem. 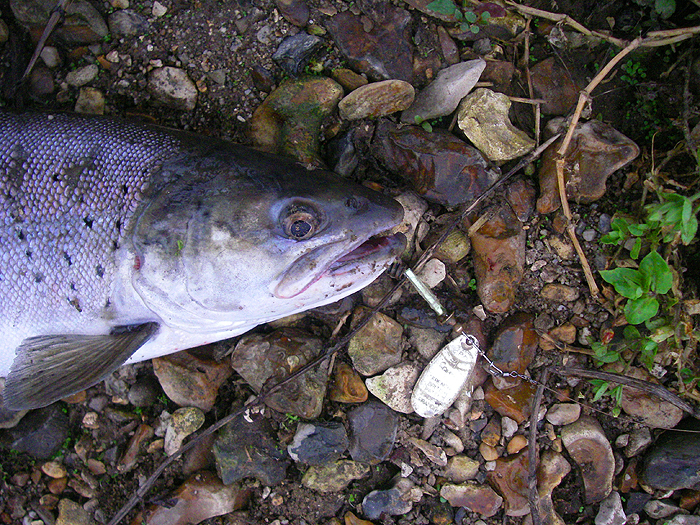 For the first half-hour it was more or less dead with no follows or takes and I walked on upstream flicking the lure ahead of me (it's wonderful how far you can cast even a small lure on fine braid - much less chance of scaring fish) and retrieving fast enough to keep the blade spinning. Every so often the hook would pick up a fragment of weed but in general it was easy fishing. 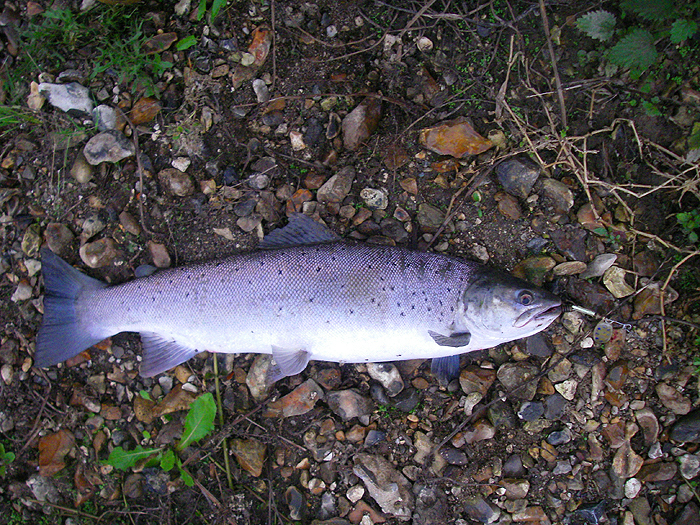 In the evening, as the light begins to fail, seatrout in my local river tend to settle in the tails of pools. Even a slight variation in the speed of flow seems sufficient to attract them, so I tend to fish just a little bit harder when I reach such a spot. Anyway, I'd just covered the fastest flowing stretch in the entire reach without even a pluck and was about to fish the pool upstream of the rapid. I stood ankle deep in the water and pitched the Mepps as far as I could up into the glassy surface of the pool (the fish are easily scared in the shallow water). I began to wind and the lure had probably covered about ten metres when it was siezed and a cracking fish exploded into the air. This was more like it. Line was dragged from the spool with the clutch zuzzing and then the fish turned and hurtled down into the fast water. Every few seconds the trout would leap into the air before making another powerful run - fantastic! I paddled downstream towards a little island of gravel where I thought I'd be able to slide the fish ashore but it was a couple of minutes before I beached it. My heart was in my mouth in case it came unstuck (like the last seatrout I hooked) but there was no need to worry and before long I was able to take a couple of pictures, unhook it, weigh it (just under five pounds) and slide it back. I checked the gear to see that everything was in order before once more casting upstream into the pool where I'd hooked my fish. Was that a bite? It seemed likely as there were no snags present. I scrambled onto the bank and walked upstream so I could fish the pool casting down and across. First cast and I was in. At first I thought it was another trout as it splashed and wriggled but it turned out to be a good perch of perhaps a pound-and-a-half which came unstuck just as I was about to land it. I had a few more casts but that proved to be that for my hour's fishing. More than enough to satisfy me and to make me want to give it another go. Perhaps I'll venture to the coast soon - it's high time I caught a decent bass.